"....Fowley is such a gargantuan shuck that he ought to be preserved in a time capsule. .."
That line has stuck with me and characterized Fowley for decades and now it comes full circle where we have an opportunity examine how the Sixties counterculture produced marginal sorts who were happy to have a niche somewhere in the music greatness others and those like Charlie Manson who wanted to change to change the world into a larger version of their insane selves. It was a crap shoot either way, and lucky for us Fowley wasn't as crazy as he pretended to be. 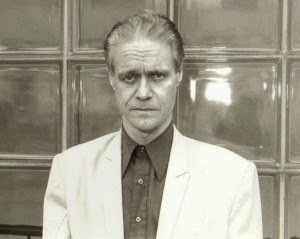 It's always been my impression that Kim Fowley preferred you spoke about him in the past tense when you were in his presence, the closest and quickest thing he can have to his desire was to eavesdrop on his own funeral. Only a fool too fast of tongue of slow to truth would argue that Fowley didn't have some kind of observable genius in the happenstance of his life. He was an Ezra Pond sort his era, someone with a smattering of talent themselves who had a more acute instinct for the large talent of others . It can be a tedious thing to hash through again, but it bears repeating that Fowley's greatest masterpiece was creating a string of performance-oriented personas, all of the extreme, gaudy, tacky, neurotic and, rather desperate in their attempts to equal the art being produced by artists he was attracted too. Fowley was someone who,like thousands of others at the time, were trying to berserk themselves into genius who, despite hard work and an unblinking commitment to the mask he was wearing,never convinced anyone that there was anything there but an egocentricity that was oddly ingratiating Fowley, I suspect, knew that we were onto his game from the get-go and let it remain as such. Fowley was someone who wanted to leave his mark on history and didn't quite much care what damage to his reputation he suffered in doing so. It wasn't damage at, I think he'd have explained to us, since this was a reputation he was reputation he was creating in place of one that didn't exist in the first place. What he wanted was to be known, to be creative, to be a part of the throng at the higher creative plain. He wanted to leave his mark on history, not change it, not destroy it, not change to course of things to come. His desire was to be in the perennial now of whatever was intense at the musical time and space and to have a sufficient version of his cover story to accompany. He was a man who lived his life in the present tense.What is remarkable is that he remained in the game as long as he did. Fowley was a fake, which was the source of authenticity. He decided to "act as if..." and never stopped acting.I regard Fowley's whole life as being something like Kafka's Hunger Artist; the man who refuses to eat draws a crowed around him and it's that artist's job to keep the crowd distracted while maintaining his cover. Fowley kept the mask on but remained an approachable anomaly. No easy thing to do.